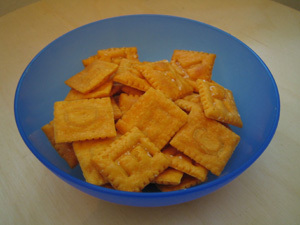 Scrabble CHEEZ-IT: have your fun and eat it too. 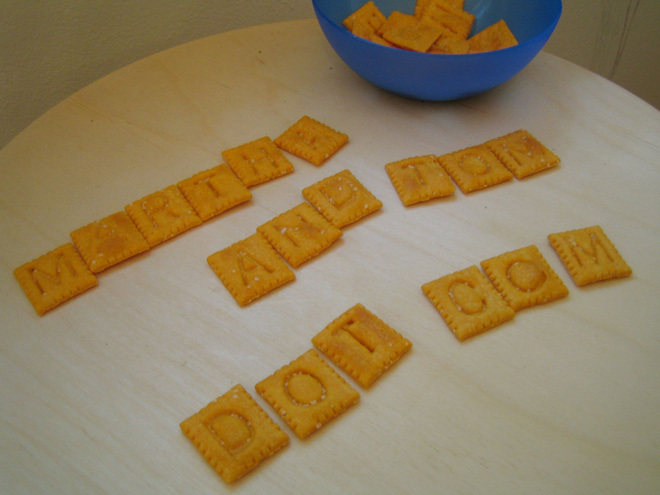 Scrabble Junior edition Cheez-Its! I don’t buy a lot of boxed or bagged snacks aside from tortilla chips. Tom, of course, loves to make his own crackers. So why the draw? They’re not local, they’re not good for you… blah blah blah. Please! SCRABBLE crackers don’t come along every day. As expected, they taste just like regular Cheez-Its, possess the same power of addiction as regular Cheez-Its, and have the same aftertaste as regular Cheez-Its. However, they taste much better than Scrabble pieces. 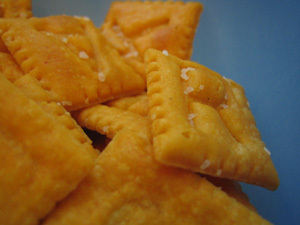 In conclusion, what other snack affords so much fun? Thanks to Marcela for hunting down all of those Ts and Ms for us. This entry was posted by Martha on Friday, May 29th, 2009 at 3:53 pm and is filed under Food + Drink. You can subscribe to responses to this entry via RSS. where can i get these! !